We usually save the best for last don’t we? 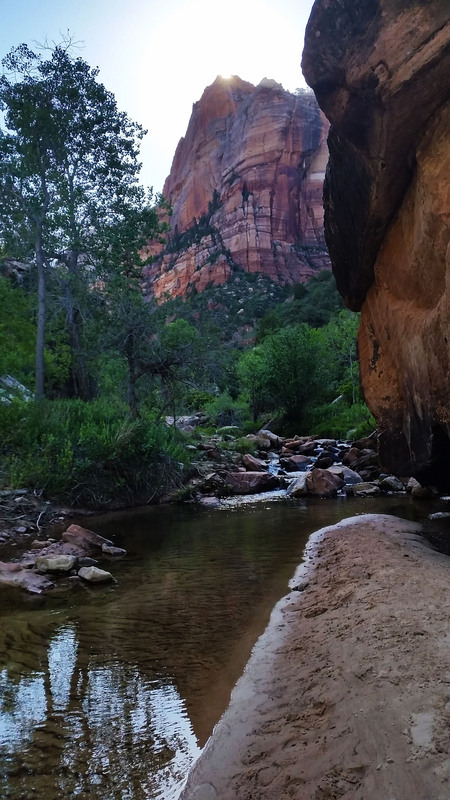 A group of buddies (Mike, Stevo, and Adrien) and I decided to trek to Zion National Park in southwestern Utah in search for adventure. 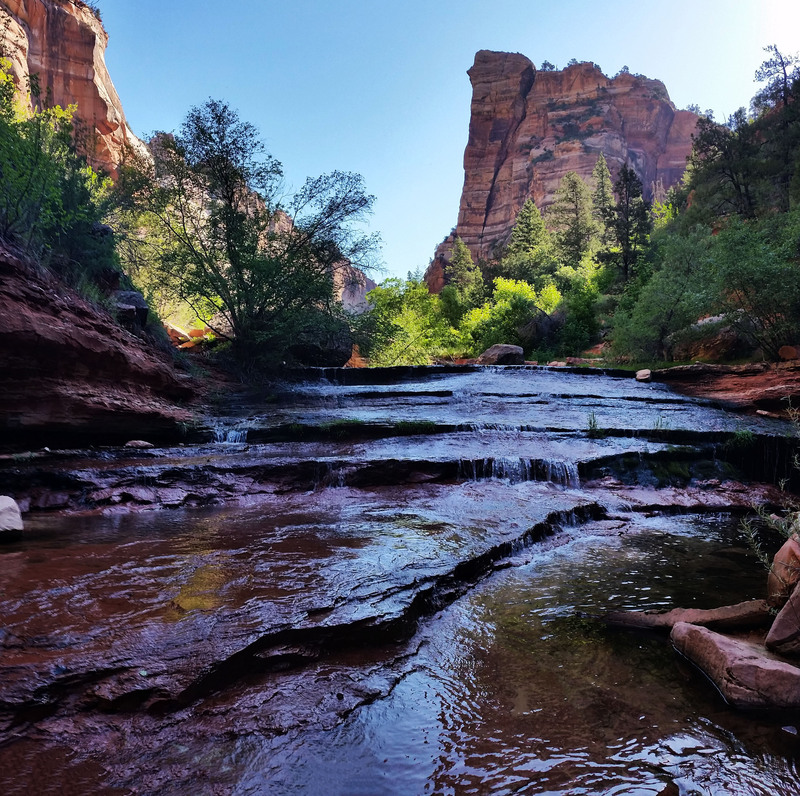 On our last day we had permits to The Subway, a rock formation on the Left Fork of North Creek residing on the west side of the park, far from the main valley of Zion. There are two ways to visit The Subway, one as a technical canyoneering route from the top down, or a non-technical hike from the bottom up. 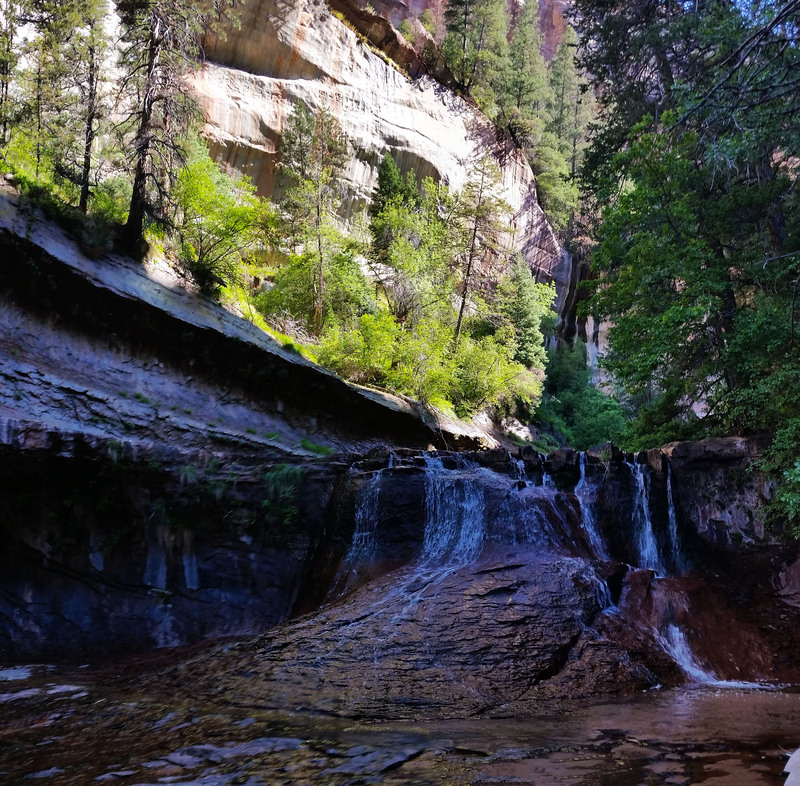 Due to time restraints for the day we decided to hike from the bottom up, and we weren’t disappointed! 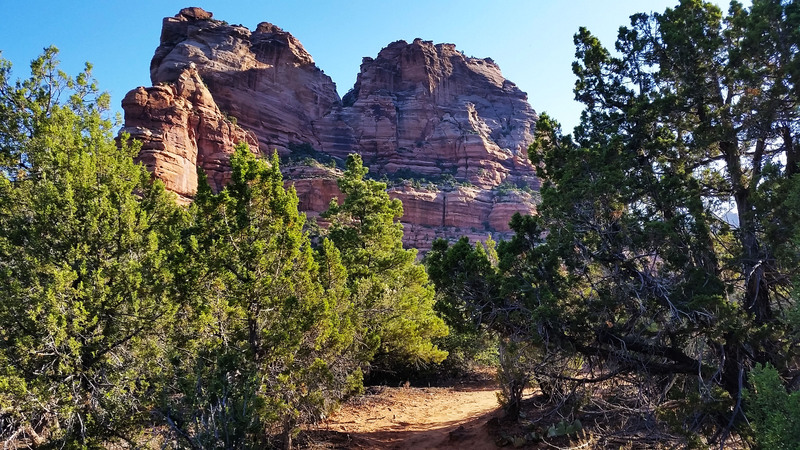 We woke early and packed our camp up, piled into our vehicles, and headed west down Highway 9 towards Virgin, where we would turn north down the open road to the trailhead. Utah is such a beautiful place. An open landscape with orange and red rock plateaus to the right, small plateau mounds to the left, and rolling hills ahead lead us to our turnoff. Bluebird, virtually cloudless skies welcomed us on the winding road through farm fields to the dirt pull off for the trailhead. Once we pulled in there were a couple of park rangers that told us there was a guy down below that hurt his leg and couldn’t hike out so they were going to arrange a helo to come up and grab him. Little things like this always make me nervous before a hike, like bad juju or something. It didn’t help the fact that Stevo had been complaining about his knee having troubles as the weekend progressed and he put more miles on it. Brushing it off we pushed down the trail with excitement to see The Subway at the end of our 3.5 mile hike. The trail took a dive-bomb off the rim down into the canyon! Loose gravel dominated the trail as it twisted and turned dropping 600 feet to the creek below. In the bottom the light was perfect. 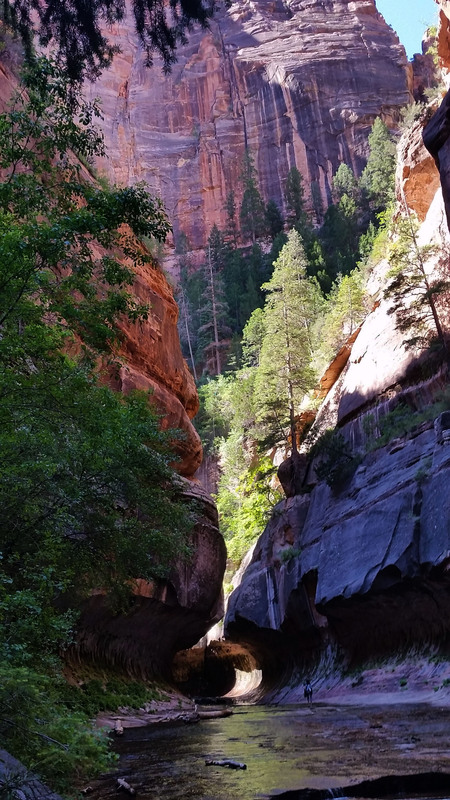 We hiked northeast up the canyon and it was early enough that the sun just lit up the canopies above in golden light. 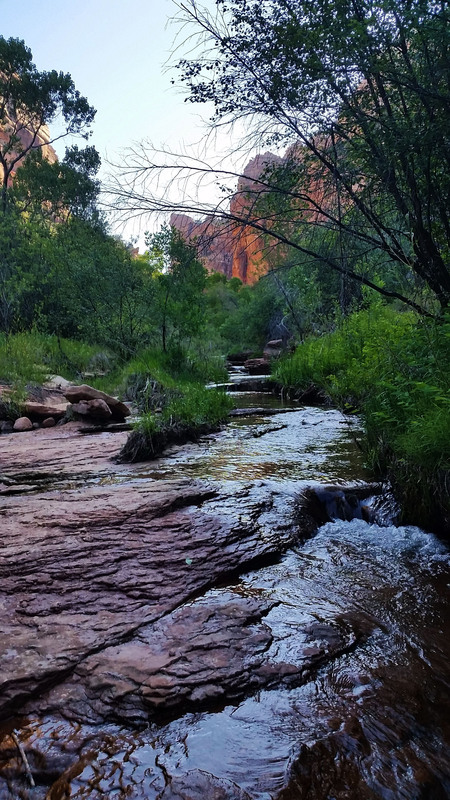 We crossed back and forth over the creek, boulder hopping, traversing sandy creek banks, and large rock faces obstacles. Turn after turn there was something interesting to see. Soon the canyon began to change. The tall walls from afar started to close in and you could see the impact of water high up from long ago where it carved the rock face smooth. Miniature waterfalls and small swimming pools dotted the landscape, and the lush green canopy continued to slowly close in to shade us from the sun above. The creek began to flow over large stepped slickrock steps, creating mini falls, and we were forced to walk down the creek in the thin layer of water over the slickrock. The canyon curled right and we finally entered the first area where it was no longer a typical creek bed canyon and the rock formations became more predominant. The water cut away, shaped, and formed everything around us. The small cascading falls became larger and taller causing us to climb around on the tree covered sides to bypass. 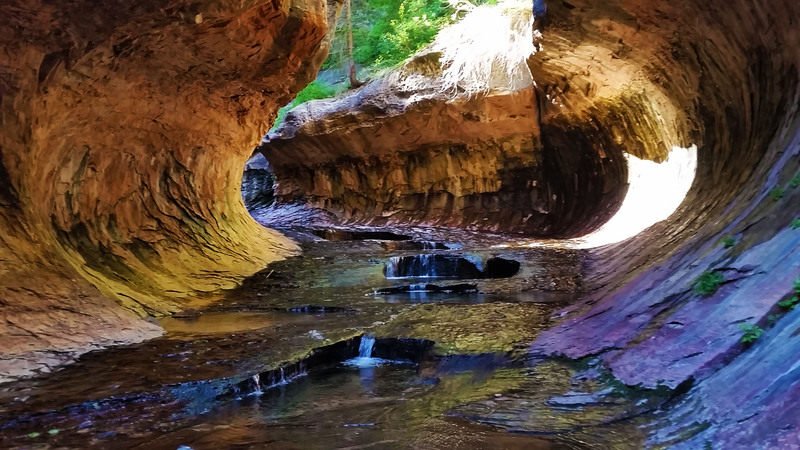 Long smoothed-over cracks were found in areas of the slickrock, as well as small circular holes called potholes where the water pooled and flowed through. I can only speculate that upon formation, these areas had less dense rock which was eaten away by erosion causing the beautiful formations we were surrounded by. We finally reached the last turn before The Subway and we all gathered together before pushing on so we could all see it at once. What a view! 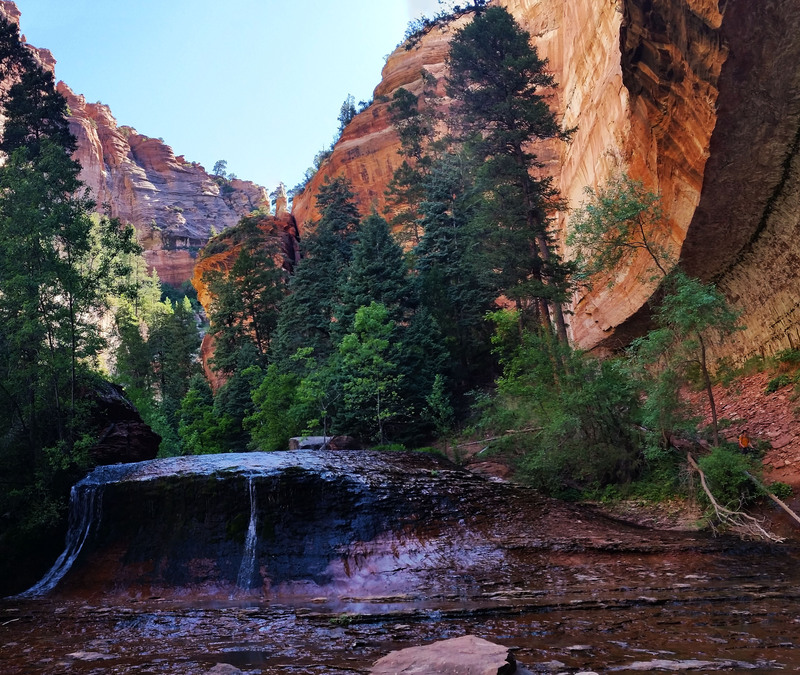 It looked as though the water tunneled straight through solid rock to form a Subway tube through the bottom of the canyon. 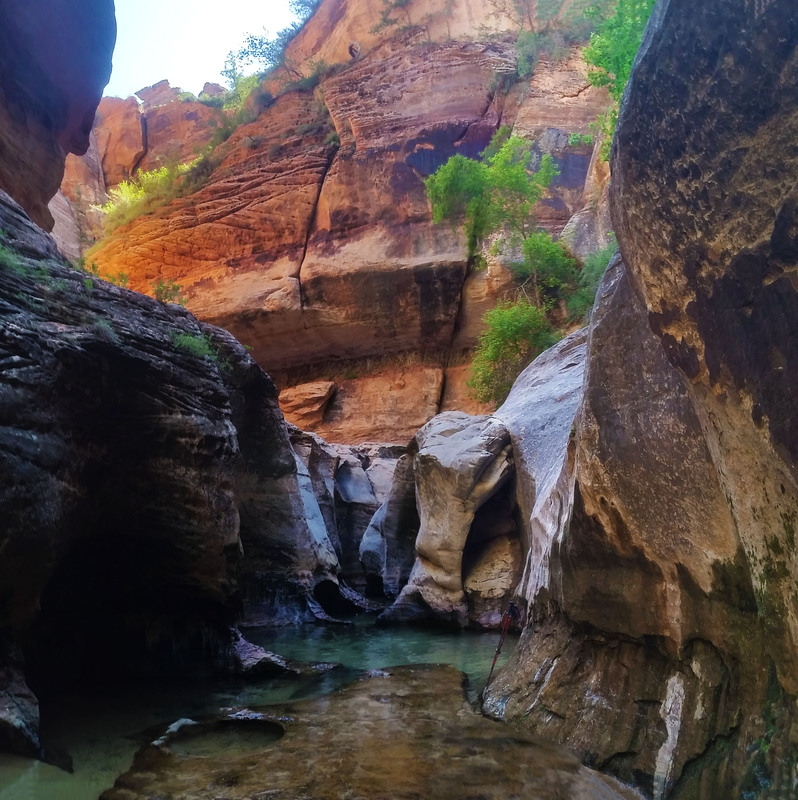 It was strange how cylindrical the formation was, nothing else around was like it except in this one tight spot in the canyon the perfect conditions came together to create this remarkable place. We pushed to the back of the Subway where a few consecutive deep pools awaited. One after another we hopped in and waded in the cold 50 degree water that came chest deep, just to make it to the Key Hole waterfall in the back. Mike jumped in, taking a brisk shower in the falls. Wheeeww boy was it cold! Soon after we all returned to the Subway, all smiles. It’s amazing how some places can totally regenerate you. All the exhaustion of the day is just lifted form your shoulders and you are ready to get back to it. This is one of those places. 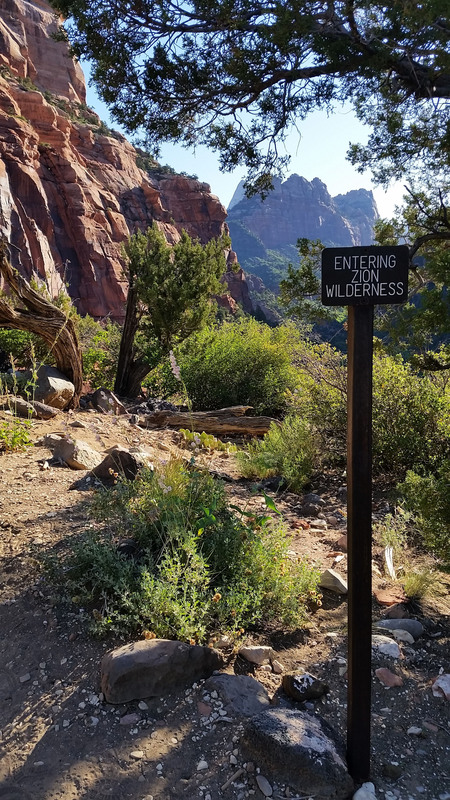 Although I am not the largest fan of the permit system, I can respect it for protecting this very special place from being overrun and overused. At any rate, it was a beautiful day and we got to see something special. We returned the way we came without incident, piled in our cars, and headed home. This adventure for this weekend was over, until the next one! We woke early, just before daybreak, and started stoking a fire for breakfast. A few friends (Mike, Kenneth, Eroica, Greg, Thomas, Manuel, and Jake) and I had decided to take a weekend of exploration in Yosemite. For me, Yosemite was a bucket list item and I was super excited to finally have the opportunity to experience it. 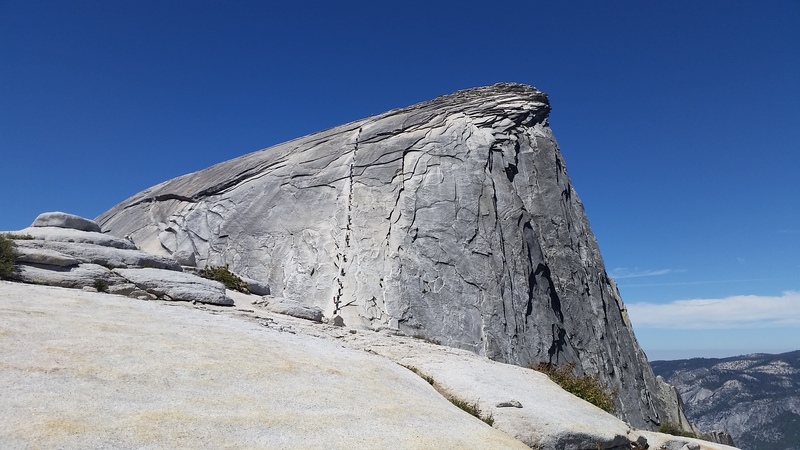 This day was especially exciting as we planned to hike to the top of Half Dome, the most recognized formation of the valley. Master Chef Mike got on the grill and before long we were all fed, dressed, and packed up for the day’s hike. We were camped just outside the park so we all piled into a couple of cars and took off towards Half Dome trailhead for our 16 mile round trip journey to the summit. Driving into the park took some time, winding in and out on the entrance road until the views finally opened up to huge granite walls bathed in morning light and lush green foliage lining the roadside. We pulled in and grabbed the first open spot we could. In the shade the temps in the bottom of the valley were cool, and in my shorts and t-shirt I moved quickly to fight off the chill. Next footbridge past Happy Isles, the river was crashing hard here! 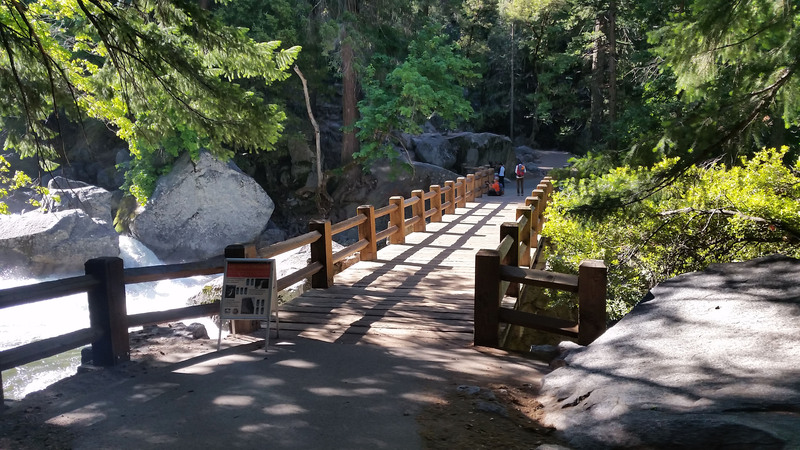 Soon we walked over the Happy Isles Bridge crossing the Merced River that feeds the valley. This also just so happened to be the start of the JMT, let’s just say I was really excited all around! 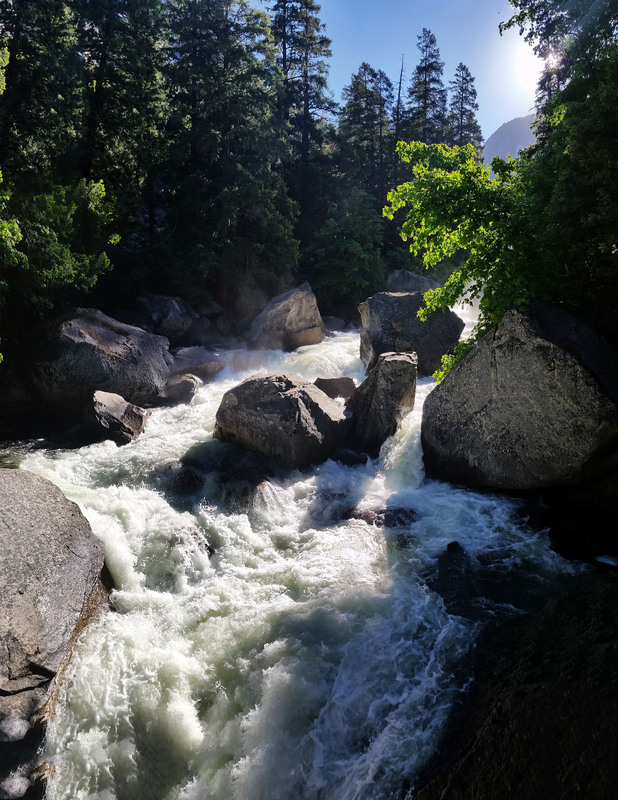 We crossed another foot bridge and paused for a moment to stare upstream in awe. The river was fierce and crashed down the sides of the riverbank with a violent force that demanded nothing but respect for its pure power. We trekked on and, as always, the group of 8 began to slowly string out. As we all stopped for a quick water refill and a bathroom break before really getting into the hike, Greg said he has going to trek ahead. Off he went, and before long we soon followed. View from the footbridge above, nature is such a beast! Mike and I soon pulled away from the group too as the incline began to increase, but we didn’t notice as we were both too awestruck by the views of the woods around us and the river flowing nearby. 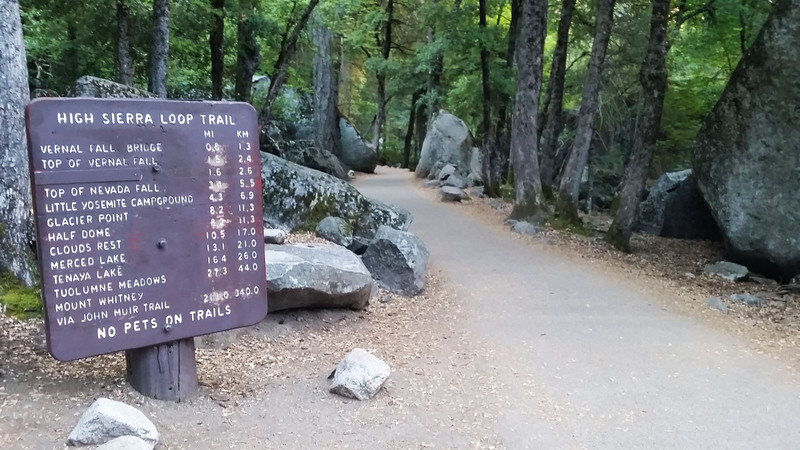 We took a slight divergence from the JMT to go up the Mist Trail. 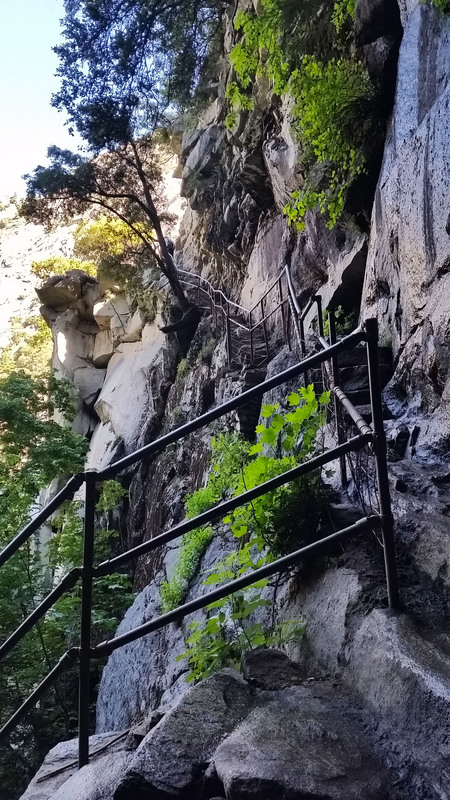 We trekked on and up the granite steps and were soon blasted with a huge mist from Vernal Falls. The sun was shining through and creating a breathtaking rainbow making the whole experience that much more surreal. We stopped and just took the whole thing in as we were getting sprayed by the falls above. The trail really went to work after this, almost going straight vertical to climb above the falls. Up and up we went until one last switchback brought us to the head of a gorgeous fall. Mike said, “I’ll wait here on the others as they don’t have a map and don’t know the way.” All smiles as usual I headed on alone. I’ve always enjoyed hiking in groups, but sometimes it’s nice to just pull away and enjoy the trail on your own. 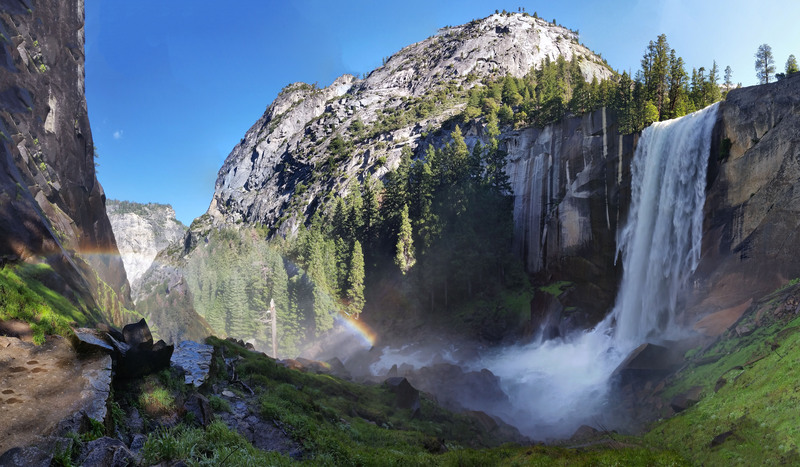 I pressed on, up the Mist Trail, through the cool forest until I came upon another set of falls; Nevada Falls. Turn after turn the beauty of this place was unquestionable. 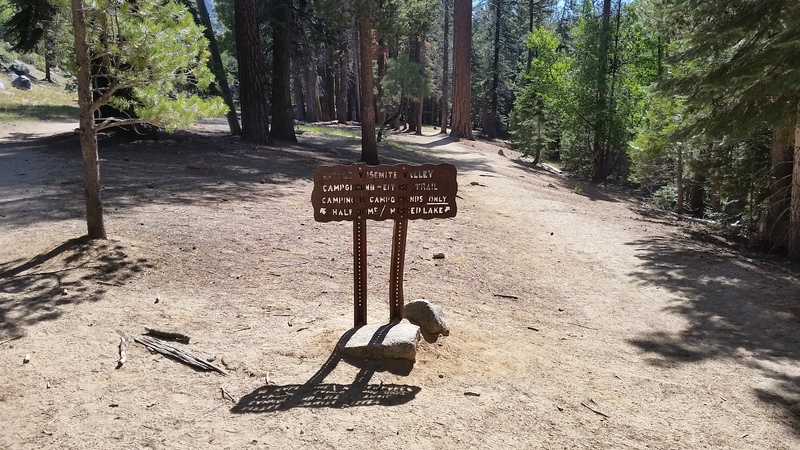 That matched with the challenge of the hike really kept be going until finally I reached the junction where I would rejoin the JMT to find Greg chilling out on a rock on the entrance of Little Yosemite Valley. Like a lizard he was just zenning out, having a nice little rest before taking on the next leg of the trek. I plopped down and grabbed a quick snack and we chatted about the trail below. Little Yosemite Valley . . . hmm which way to go?! Greg, like me, really likes to get after it on the trail and we decided to press on, knowing the group would eventually catch up at Half Dome. Through the flats of Yosemite Valley, the foliage and terrain began to change. We were above 5000 feet now and as we got away from the river we entered an area where pinion pine reigned supreme. The tall red barked trees sparkly shaded us from the sun as we pushed quickly towards the base of Half Dome. A new turn would open up to the valley below or views of the snow-dusted Sierras peaks in the distance. We took a few moments to take in each new view before pushing on and up. We were both ready to get to the top as the sun beat down on our heads. 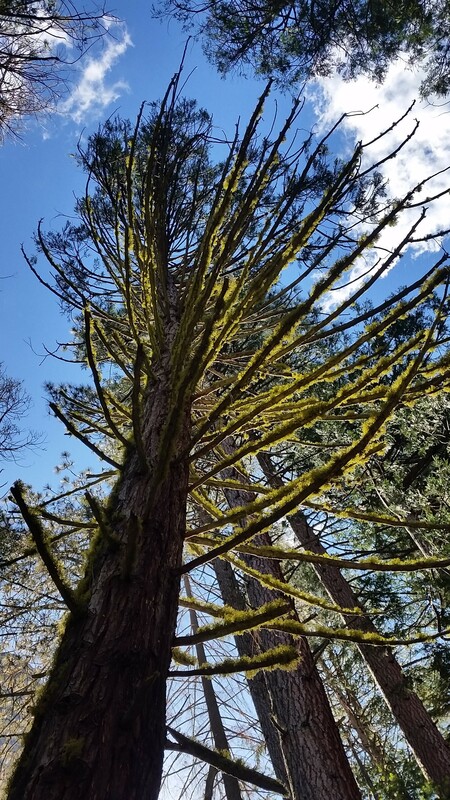 The trees were gorgeous, light hitting the moss, was just spectacular! At the base we encountered 2 Park Rangers with an iPad checking permit holder names like a couple of bouncers at a club. My name was on the list and we grinned as the red rope was taken back and we pressed hard up the steep backbone of the dome. Steep and fast our hearts were thumping at full throttle when the infamous “chains” came into view. The line of people looked like ants in the distance and I was excited to take on the last extremely steep and slick 400 foot climb to the summit of the dome. The line was almost stagnant between the chains; some clutching the metal bars holding up the chains, other stalled waiting for someone to pass or move forward. Half Dome! Those are not ants, they are people! Greg looked at me and said “man, let just go, popping his head under, pulling up and climbing on the outside of the chains to gain summit. People looked at us like madmen as we passed, some full of fear in their eyes and others with frustration for the wait ahead, but they all were too cautious to take to the outside of the chains. Light lightning we were up, politely excusing ourselves to the climbers stuck between that chains as we bypassed them, all until the crowd grew thin and the grade finally flattened out. We were only steps from the summit! Touching the top at the same time we claimed summit and took in the incredible views. 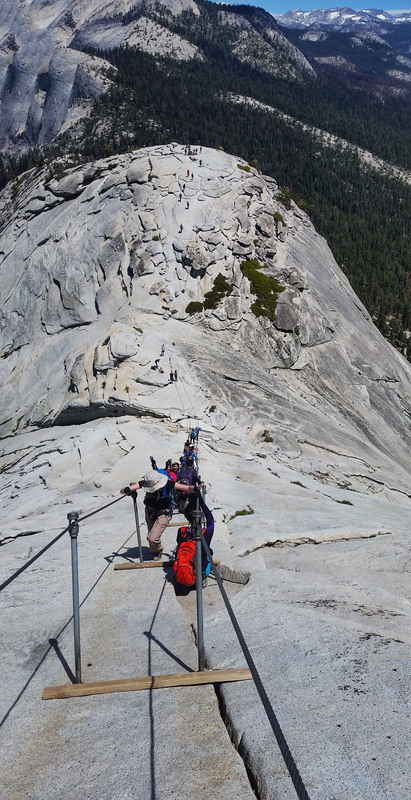 Of course it was picture time, we took turns, walking to the edge, climbing out on diving board rocks and staring down the sheet walls of the front of Half Dome at the valley below. Views from the top! What an awesome sight! After the picture session was over, we both chilled out and had a nice 20 minute nap before finally heading back down to the base. On our way down we ran into the rest of the group on their way up. Greeting them with smiles we encouraged them that the chains ahead were not too bad and the sights at the top were pure beauty so they headed on. At the base Thomas and Mike waited for their chance to summit as they were short 2 permits. Mike found a permit opportunity, and soon after Thomas did as well. I headed back up once more with Thomas to make sure the last of our group could enjoy the views at the top. Views of the river upstream of the falls before it turns into a raging washer machine, Thomas did a little swimming here on our way back! Once down, we regrouped and headed back the way we came back to the trailhead where our cars waited on us. What a beautiful day! 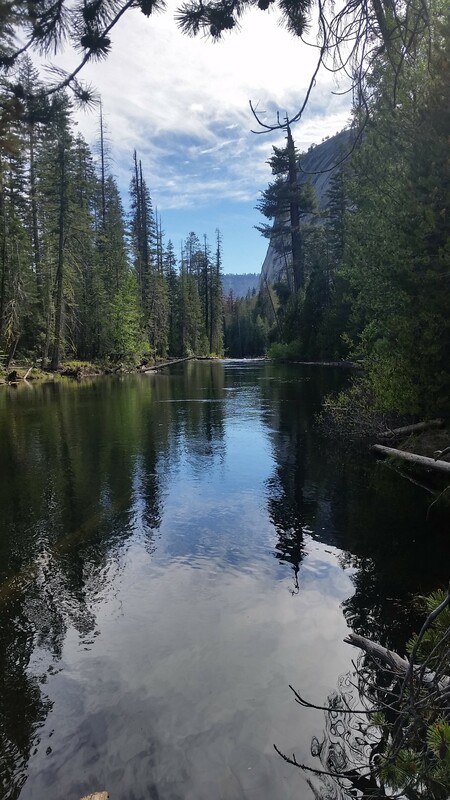 Any day spent outside in the beauty of nature really makes me appreciate and enjoy the opportunities I’ve been given, especially at such an incredible place as Yosemite. Get out there, and if you do, it will blow your mind! 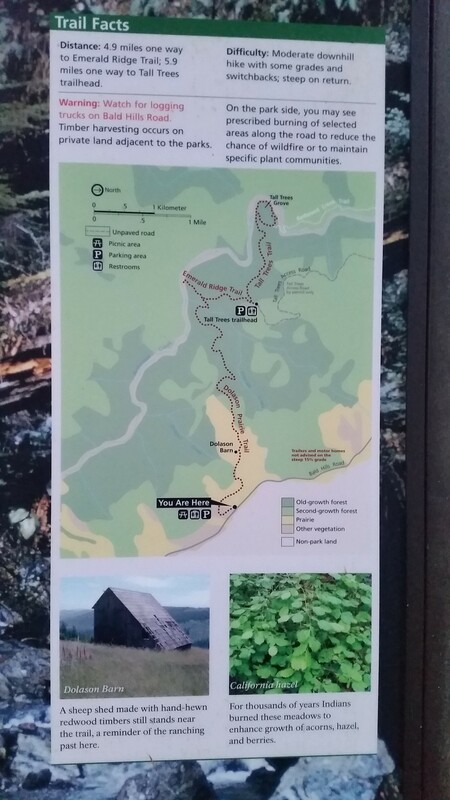 Mist side trail? Why not! The flowers got me smiling! 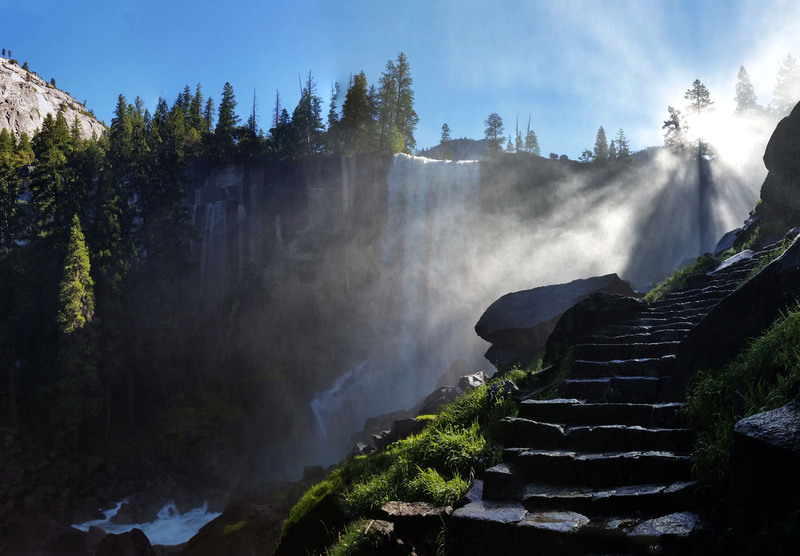 Mist Trail, killer light action!